A Legacy Paver is the way to leave a bit of yourself at your school. Don’t miss this opportunity to add your name or the name of a loved one with a message to the “Legacy Paver Path” at your school’s entrance. 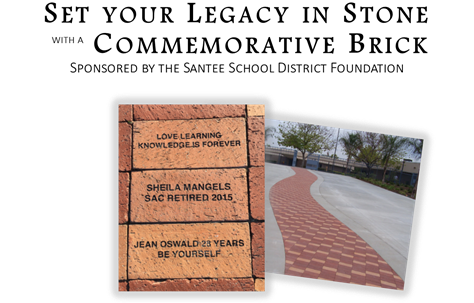 The Foundation is selling engraved bricks for each “Legacy Paver Path” that can be personalized with your name, the name of a family member, friend or teacher, and a personal message. Each brick can be engraved with up to 2 lines (See below). An engraved brick makes a perfect graduation gift or teacher thank you gift. Upon request, a certificate for a gift purchase will be provided. A Legacy Paver is only $75 and a portion of the cost is a tax-deductible expense. You can get a 3-pack for only $200, a $25 savings! Click on an Order Form below to get your Paver ordered today!